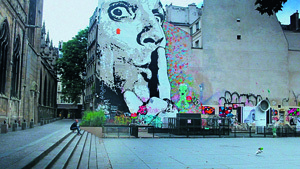 The UK execution explores Parisian cityscapes, including aspects of Paris that you don’t always see. The UK half of this bilateral campaign set out to remind people about the amazing experiences you can have in Paris (a mirror-image ad ran in France, reminding its audience about the charms of London). Shot in a gritty, urban style, it also takes us into interesting bookshops, bars and restaurants while hinting at romantic possibilities. The final frames show an empty seat on a Eurostar train and the strapline: "Stories are waiting." We see the car "driving" over "obstacles" that turn out to be trompe l’oeil designs painted on the road. To tackle the preconception that SUVs are inefficient and position the CR-V 1.6 diesel as the most economical car in its class, Honda uses optical illusions to underline the point that first impressions can be deceptive. And there are lots of perspective tricks – at one point, the car looks like it’s levitating; at another, it looks small enough to fit on a table top. As the pay-off line has it: "An impossible, made possible." John Lewis Insurance "Things matter"
John Lewis Insurance’s first-ever TV ad uses stop-motion animation to show a home’s entire contents coming to life, shuffling through the house and heading out into the garden. The occupants are also swept along and take their place alongside the furniture for a family photograph. The strapline is: "If it matters to you, it matters to us." 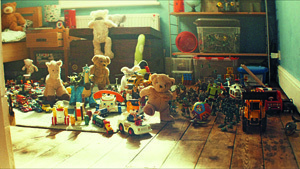 The TV campaign dovetailed with an online initiative encouraging budding film-makers to use similar stop-motion techniques to create their own six-second films on Vine. 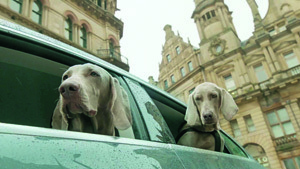 Volkswagen "There’s a Volkswagen for everyone"
The challenge was to highlight the sheer breadth of the Volkswagen range – and this spot does just that by inviting comparisons between VW models and breeds of dog. In the full edit, 36 dogs are featured, from the very small to the super-sized, and we see them hanging out of car windows, travelling through scenic locations. Part of a multimedia campaign, digital activity included www.volkswagen.co.uk/dogs, which explored dog/car analogies, and the #woofwagen hashtag. This ad, timed to coincide with the launch of Smirnoff Gold, showcases a "signature serve" of the brand: Smirnoff Apple Bite. It follows a man and a woman who are lost in a hotel and find themselves in its bar. As the house band welcomes them, we see snakes escaping from the sleeves of a barman’s shirt to create the Apple Bite. The woman looks on, hypnotised, as chaos ensues. 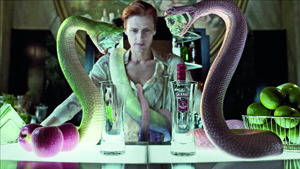 The brief was to show that Smirnoff leads the way in innovation in the vodka category, building on its "drink inventively" positioning. The great Paul Weinberger used to say that, if you have the cheek to turn up uninvited in someone’s living room while they are relaxing at home with their loved ones, then the least you can do is be entertaining. Advice often overlooked these days. Shouty, charmless types seem to be letting themselves into my house with increasing frequency. Fortunately, this month’s shortlist will, I’m certain, be warmly welcomed into the nation’s homes. And I wouldn’t be surprised if a few of them were even offered a cup of tea and a Hobnob. All have bothered to be smart and engaging. Visually interesting. And single-minded. In particular, the Volkswagen spot. Despite dogs being adland’s belle de jour (come to think of it, when weren’t they? ), it makes the point so effortlessly. It’s welcome around our house any time. The Thinkboxes, in association with Campaign, are the only bi-monthly awards that celebrate the UK’s world-beating TV ad creativity, in all its forms.